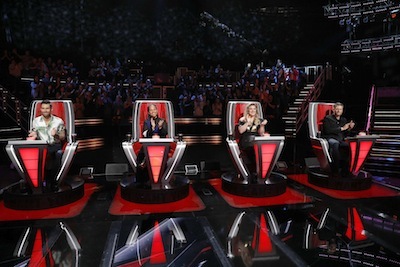 THE VOICE season 14 is adding a twist to the blind auditions: the steal. The coaches have never refrained from pulling any trick at their disposal to woo a contestant to their team, but now they each have one block at their disposal to use during the blind auditions. However, it has to be utilized wisely—they need to block their fellow coach before the potentially-blocked coach turns their chair; if they try to block them and the coach never turns, the blocker gets it back to use later. The blocked coach only learns they’ve been blocked when they see the bright red “BLOCKED” where their name normally lights up post-chair turn. Can THE VOICE Top 11 Guess the Coaches’ Song Titles Based on Emojis?